← James Campion speaks with artist Ken Kelly! The Star Wars Battlefront Beta is coming to PS4 in early October! As most of you may have heard, the Star Wars Battlefront (Beta) is set to come out in early October for PS4 users. Star Wars video games have certainly come a long way since the first licensed video game was released in 1982. 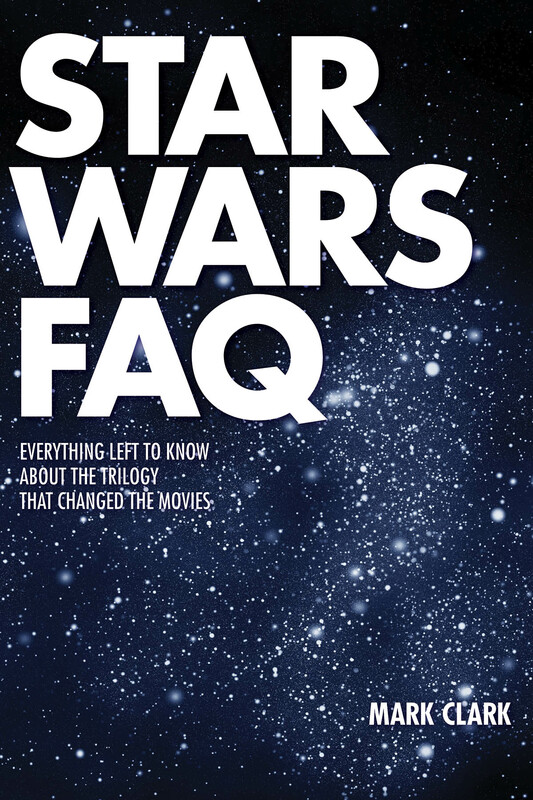 In his new book, Star Wars FAQ, Mark Clark talks about the first ever video game that Star Wars licensed and how these video games slowly, but surely, gained popularity. Read about it below! Custom, homemade Star Wars computer games have been around as long as Star Wars fans have owned home computers. But the first licensed, Lucasfilm-authorized electric game was Parker Brothers’ Star Wars: The Empire Strikes Back (1982), created for the Atari 2600 system. A year later, a version was issued for Mattel’s Intellivision platform. Star Wars: The Empire Strikes Back was a simplistic, scrolling shooter game with primitive graphics. The player flew a snowspeeder and attacked AT-AT walkers, as seen in the Hoth snow battle from the film. The player won the game by destroying five walkers; if the Walkers reached Echo Base and destroyed it, the player lost. Although sales of Star Wars: The Empire Strikes Back were not spectacular, the game performed well enough to encourage the development of more product. Parker Brothers issued Return of the Jedi: Death Star Battle and Return of the Jedi: Jedi Arena in 1983. In Death Star Battle, produced for the Atari 5200 and Atari XE platforms, players piloted the Millennium Falcon through a squadron of TIE fighters to destroy the second Death Star. In Jedi Arena, made for the Atari 2600 only, players battle one another with lightsabers. A third game, Return of the Jedi: Ewok Adventure, was prototyped but never released. The first Star Wars arcade game, produced by Atari and simply named Star Wars, also appeared in 1983. This was a sophisticated (by early 1980s standards) first-person shooter/flight simulator featuring color 3-D vector graphics. The player relived the climax of Star Wars, taking part in the assault on the Death Star from within the cockpit of an X-Wing fighter. Successful players cleared three levels—overcoming an initial engagement with TIE fighters; then destroying turret guns on the surface of the space station; and finally zooming through a trench and firing a torpedo into the exhaust port to destroy the Death Star. Players continued to be harassed by TIE fighters throughout the second and third levels. The game featured sound effects and snippets of dialogue from the film—including the voices of Mark Hamill, Harrison Ford, James Earl Jones, and Sir Alec Guinness. Star Wars was sold as a stand-up console and in a deluxe, sit-down cockpit version. In either configuration, it was a massive hit and remained in production for five years. It became a fixture at many arcades in the United States and the United Kingdom, and fans set video game endurance records (authenticated by the Guinness Book of World Records) playing it. Parker Brothers released a scaled-down home version in 1984 for Atari and Coleco game systems, and the Commodore 64 computer. In 1987 and ’88, it was reconfigured for nine more game systems and reissued. Readers of the website Killer List of Video Games, an online community of video game enthusiasts and preservationists, voted Star Wars the fourth-best coin-operated video game of all time (trailing only Pac-Man, Donkey Kong, and Galaga). Atari introduced a second Star Wars arcade game, Return of the Jedi, in 1984. It featured more lifelike raster graphics and included four levels, some replicating the speeder bike chase scene and others the climactic Death Star battle. A home version was also produced. The true follow-up to the Star Wars arcade game was Atari’s The Empire Strikes Back, released in 1985. It was another 3-D vector graphics first-person shooter/flyer based, like Star Wars: The Empire Strikes Back, on the Hoth AT-AT/snowspeeder battle. Neither of Atari’s sequels proved as popular as the original Star Wars arcade game. Japanese game maker Namco released an adventure game titled simply Star Wars in 1987, created for Nintendo’s early Famicom console. The designers of this game seemed completely unconcerned with fidelity to the source material. In it, Luke Skywalker pilots the Falcon to various planets to rescue Ben Kenobi, Princess Leia, Han Solo, Chewbacca, and the droids. Each planet is protected by a different Darth Vader, some of which transform into various creatures (a shark, a scorpion, a Wampa, and a dinosaur). Luke has black hair and Chewbacca speaks English. A year later, Mastertronic released a computer game, Droids: Escape from Aaron, based on the Star Wars: Droids cartoon. This was an adventure game in which Threepio and Artoo escape from the clutches of the Hutt-like Fromm criminal gang. The events depicted in the game did not derive from the TV show but were in keeping with the continuity of the program. During the 1980s, Lucasfilm simply sold Star Wars licenses to various game manufacturers and wasn’t always able to exert quality control over the end product. Fed up with the scattershot quality of these games, George Lucas revamped his Lucasfilm Games division to form LucasArts, which designed and manufactured games in-house. Initially, LucasArts partnered with Atari to produce games based on Labyrinth (1986) and Indiana Jones and the Last Crusade (1989). Later, on its own, LucasArts created original adventure games such as the long-running Monkey Island series (1990–2011) for various game systems and computer platforms. Perhaps waiting until Lucas was certain LucasArts had hit its stride, the company didn’t release a Star Wars game until 1993, but it was worth the wait. Star Wars: X-Wing—a combination flight simulator and adventure game, with players battling imperial forces in a trusty rebel fighter—was a smash, spawning multiple expansion packs, collector’s editions, and sequels. More than twenty more Star Wars video games were issued prior to the release of The Phantom Menace in 1999, including Star Wars: TIE Fighter (the first game set from the perspective of the Empire) in 1994, Star Wars: DarkForces in 1995, Shadows of the Empire in 1996 (part of a multimedia event, see previous chapter), and Star Wars: Rogue Squadron (1998), all of which proved very successful. Star Wars games have remained the primary focus of LucasArts since the mid-1990s. In more recent years, the company has expanded into the realms of realtime strategy, role-playing (RPG), and, finally, massively multiplayer online role-playing games (MMORPG) with Star Wars Galaxies (2003), Star Wars: Clone War Adventures (2010), and Star Wars: The Old Republic (2012). LucasArts spent a then-record $200 million developing The Old Republic, a pay-to-play download that allows players to interact together online. The game collected one million subscribers within three days of its launch. All three Star Wars MMORPG releases were multimedia events, with novel, comic book, and toy tie-ins. Posted on September 4, 2015, in Film & TV, Pop Culture and tagged Applause Books, book excerpt, Mark Clark, Star Wars FAQ. Bookmark the permalink. Leave a comment.